Rising sea levels, increased precipitation and inland floods are but a few challenges facing cities amidst increasing global temperatures. Add to it worrying number of deaths from air pollution, overpopulation, waste-disposal problems, poverty and one cannot help but see the need for urgent action. The question is what can be done to slow down and eventually reverse these trends? From 16th to 17th March 2019, the oikos Spring Meeting 2019 focused on the topic of Sustainable Urbanism in an attempt to find an answer to the question. 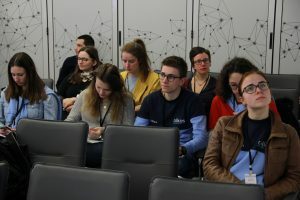 By bringing together students from around the world and leading sustainability professionals based in Belgrade, Serbia the event assessed the extent of urban problems, looked into the world of sustainable cities and charted a path for getting there. A panel on the quality of air discussed the connection between climate change and air pollution. Our panelists, Mirjana Jovanovic and Vladimir Durdevic also talked about main polluters such as thermal power stations and how poverty sets people to look for the cheapest energy resources like wood. “It does not matter where the pollution is coming from it affects every area and all of us” – noted Vladimir and suggested three main solutions for mitigating the problem: smart energy production, sustainable urbanism and phasing out fossil fuels. Mirjana further recommended state intervention to provide funds and subsidize people with lower incomes to accelerate the move to cleaner resources. But they were cautious in saying that so solution fits all and city problems should be tackled considering local insights. oikos members too shared main stumbling blocks affecting their cities in this domain. “No drama is necessary”, urged Ksenija Lalovic, “others have solutions”, as she emphasized the importance of international collaborations and the need for improving governance through cross-country exchanges in building sustainable cities. 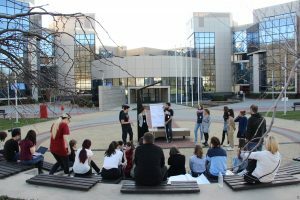 Ksenija explained how countries from all over the globe could come together and share their decades or even centuries old experiences to mitigate problems caused by extreme weather and build more resilient urban communities together. She was unequivocal in saying that the current generation of youth was the one that would need to take the lead in the fight against climate change. But she also noted the role of her generation in one of the most memorable lines of the meeting: “The mission of our generation is to pave the road for youth to make the change!”. Standardization can be a weary topic, but not when a speaker shares the sentiment and is determined to make a talk on quality frameworks and models interesting. Mladen Djuric introduced participants to ISO standards and its requirements. “It is extraordinary significant to understand Quality Thinking, in order to work with standards for management systems (especially in their implementation)” – pointed he out. The standards bring quality thinking to the core of management and hence help cities become smarter and more sustainable. Over the course of two days, the participants learned about smart energy planning and how the city of Belgrade approaches the problem. 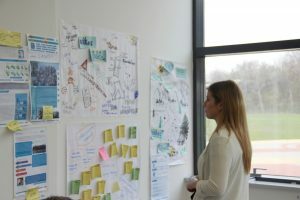 They gained insights into integrated projects at the University of Belgrade that connects soon-to-be journalists with fellow students from the department of architecture to tackle local urban issues. oikos members joined the dots to draw a picture of a unicorn startup, that can survive initial uncertainty and fly high in the world of innovations. Finally, they delved into the topic of climate change thanks to talks from Djordje Samardzija and Vladimir Durdevic. At workshops, our participants developed ideas for startups and innovative business models, as well as looked into the practice of aquaponics. A big finish came with an inspiring oikos Project Fair, where our chapters introduced their local initiatives and shared ideas for cross-chapter collaboration. The participants left the meeting with a determination to bring the new knowledge to their chapter communities and act upon it to create better, more sustainable cities.